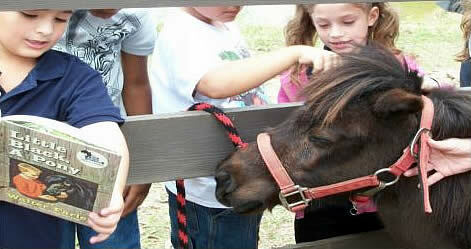 Wellington, FL – February 4, 2013 – What child doesn’t grow up dreaming of owning and loving a horse? 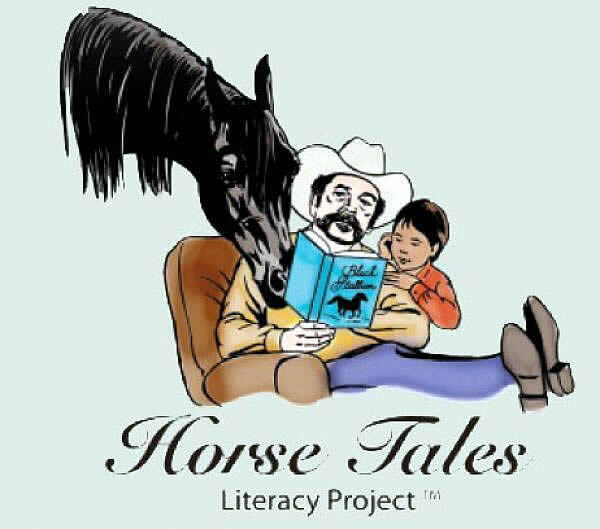 The Horse Tales Literacy Project, a non-profit organization committed to improving our literacy rate, uses that natural connection between children and horses to motivate children to read. This organization was founded by Tim Farley, son of the late Walter Farley, author of the classic Black Stallion book series, and Mark Miller, owner of the Arabian Nights Dinner Theatre. This program provides a simple but unique approach to motivating children to read by connecting them with a classic book about horses by Walter Farley and then exposing them to the magic of being able to interact with live horses. Since the organizations inception in 1999, the Horse Tales Literacy Project has reached over half a million children and educators in more than 18 states. The Horse Tales Literacy Project invites you to join them on Saturday, March 9th, 2013, at the Bridles & Backswings Golf Tournament, and to help them raise money to support these literacy programs here in Palm Beach County. The first annual Bridles & Backswings Golf Tournament will be held on Saturday, March 9th, 2013 at the beautiful Binks Forest Golf Club in Wellington, FL. with registration opening at 12:30p.m. There will be equine characters on hand from Walter Farley’s classic book, “Little Black, A Pony”, to meet and greet the golfers as they arrive. Then, the afternoon’s play will begin with a 1:00p.m. shotgun start. The afternoon of golf will include course competitions, games, raffles and prizes. After an afternoon of golf, the participants and their guests will enjoy an awards reception with a silent auction. Then, the guest will enjoy a sumptuous BBQ buffet dinner and a live equine reenactment of a scene from Walter Farley’s classic book, “The Black Stallion”, provided by the world-famous Arabian Nights Dinner Theatre from Kissimmee, FL. The purpose of the Bridles & Backswings Golf Tournament is to bring the community together and to raise awareness of the literacy needs in our county, our state, and our country. The money raised will be used to support the literacy programs provided to the children in our community by Horse Tales Literacy Project. Their programs provide a simple but unique approach to motivating children to read by connecting children with a classic book and the magic of live horses. Participants in the Bridles & Backswings Golf Tournament will be supporting the mission of Horse Tales Literacy Project by helping to raise the funds needed to keep this unique program going strong and reaching every child. Foursomes are $400 and single players are $125 – price includes golf, awards reception, BBQ dinner and live equine reenactment of a scene from Walter Farley’s classic book, “The Black Stallion”, provided by world-famous Arabian Nights Dinner Theatre from Kissimmee, FL. Dinner, auction and show tickets are available for $45.00 per person. Followed by awards reception, silent auction, BBQ dinner and a live equine reenactment of a scene from Walter Farley’s classic book, “The Black Stallion”, provided by the world-famous Arabian Nights Dinner Theatre from Kissimmee, FL.